Never dispose of used battery packs with other ordinary solid wastes, since they contain toxic substances. Always dispose of used battery packs in accordance with the prevailing community regulations that apply to the disposal of batteries. Cover the metal terminals with insulating tape in order to prevent accidental short-circuiting when disposing of the battery. Never throw the battery pack into fire, as that could cause the battery pack to explode.Never heat the battery pack,as that could cause leakage of alkaline solution or other electrolytic substance. Never disassemble the battery pack, as that could cause leakage of alkaline solution or other electrolytic substance. Never short-circuit the main battery pack by either accidentally or intentionally bringing the terminals in contact with another metal object. This could cause personal injury, a fire, or damage the battery pack. Never hammer a nail into the battery pack. Never hit a hammer on the battery pack.Never step or tread on the battery pack. Always confirm that the temperature is 5 c-35 c before you charge the battery. Leakage or deterioration of the battery pack may occur if this warning is not heeded. Never expose the Toshiba Satellite L100 L10 L15 Laptop Battery pack to any liquid. Never expose the battery pack to direct sunlight.Never store or use the battery pack in an unventilated vehicle where excessive internal temperatures may be encountered. 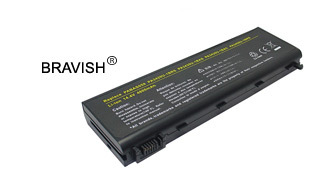 Never drop or throw the Toshiba Satellite L100 L10 L15 Laptop Batteries pack. If the liquid contained within the battery pack leaks, use large amounts of water an immediately wash off any liquid which may accidentally contact any part of the body. Remove any liquid that has contacted your clothes by washing them immediately with a synthetic detergent.